Range: Natural distribution from Southern Texas to Mexico. Introduced to South Africa. Hosts: Primarily: Solanum elaeagnifolium - the silver leafed nightshade. This genus contains more than 40 species distributed throughout much of North and South America, with at least 10 species occurring north of Mexico, primarily in the southwestern U.S.
Leptinotarsa juncta (Germar) - Eastern U.S.
Burke, H.R. 2004. Notable Weevil Specialists of the Past. Curculio, 49: 5-7. "His favorite collecting site in the Lower Rio Grande Valley was the Esperanza Ranch located a few miles east of Brownsville, TX. Many species of Coleoptera, as well as members of other orders, have the Esperanza Ranch site as their type locality. Unfortunately, this entomologically important site of original dense shrubs and woods along the Resaca de la Palma has succumbed to urbanization and exists no more as a viable biological entity." Arnett, R.H., Jr., M.C. Thomas, P.E. Skelley & J.H. Frank. (editors). 2002. American Beetles, Volume II: Polyphaga: Scarabaeoidea through Curculionoidea. CRC Press LLC, Boca Raton, FL. xiv + 861 pp. Clark, S.M., D.G. LeDoux, T.N. Seeno, E.G. Riley, A.J. Gilbert and J.M. Sullivan. 2004. Host plants of leaf beetle species occurring in the United States and Canada (Coleoptera: Megalopodidae, Orsodacnidae, Chrysomelidae exclusive of Bruchinae). Coleopterists Society, Special Publication no. 2, 476 pp. Hsiao, T. 1986. Specificity of Certain Chrysomelid Beetles for Solanaceae. Pp.345-363. in: Solanaceae: Biology and Systematics, Second International Symposium. Columbia University Press, New York. Jacques, R.J., Jr. 1988. The Potato Beetles: The Genus Leptinotarsa in North America; Flora & Fauna Handbooks No. 3.E.J. Brill. 144. pp. Lawson, F.A. 1991. Chrysomelidae (Chrysomeloidea) pp. 568-593. In: Stehr, F.W. (editor) Immature Insects. Volume 2. Kendall/Hunt Publishing Company, Dubuque, Iowa. xiv + 975 pp. Peterson A. 1951. Larvae of Insects; Part II - Coleoptera, Diptera, Neuroptera, Siphonaptera, Mecoptera, Trichoptera. Edwards Bros., Inc., Ann Arbor. 416 pp. Riley, C.V. 1867. 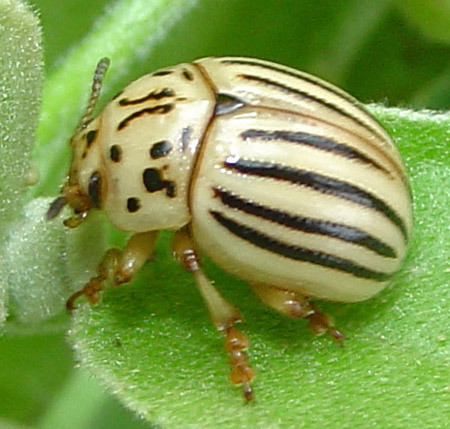 The Colorado potato-beetle. Prairie Farmer 20: 389. Riley, E.G., S.M. Clark, & T.N. Seeno. 2003. Catalog of the leaf beetles of America north of Mexico (Coleoptera: Megalopodidae, Orsodacnidae and Chrysomelidae, excluding Bruchinae). Coleopterists Society, Special Publication no. 1, 290 pp. Schaeffer, C. 1906. On new and known genera and species of the family Chrysomelidae. Brooklyn Institute Museum Science Bulletin 1(9): 221-253.